We have the first photos of the U.S.-Spec Kia Soul, the company's attempt at moving their small car offerings slightly upmarket. The car, which debuted globally in March, will make its official US debut at the LA Auto Show. 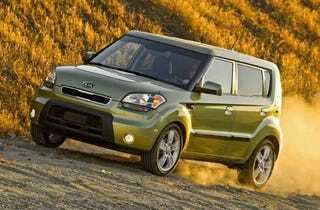 As opposed to the tiny Kias we're used to, the Soul should offer a higher level of features more inline with Scion.